Buildings cause 33% of global climate changing greenhouse gases through the energy they consume. When buildings use less energy, they can lower their operating costs and become significantly more valuable. In fact, reducing their emissions by reducing their energy consumption may unlock more than $6.5 trillion in global asset value. So why hasn’t this happened yet? This is a concept will in bring by Bluenote. Bluenote is a company from Switzerland. Bluenote is the first company in the world to launch a blockchain-based energy efficiency protocol. In may 2016, Bluenote open innovation debate for stakeholders from the international energy world at the Blue Harizon event in Amsterdam, where commercial real estate is discussed as the largest singular source of carbon emissions in cities. This was done to find ideas for the development process of Bluenote. Getting the right data to make the best decisions about energy efficiency in buildings is difficult. A building’s energy use, operational and asset value data is rarely available. If it is, it is typically siloed in vendor hardware and software products, walled off from one another in expensive proprietary solutions. Without easy access to data, building owners and investors have had difficulty proving how specific investments in building technology impact energy use and the bottom line. Bluenote will pull these data streams out of buildings and standardize it through a distributed blockchain solution called the Bluenote Protocol. The Bluenote Protocol is an open-access, confidential network that enables simple data sharing, data services, and building analysis in order to unlock new energy efficiency strategies in buildings. 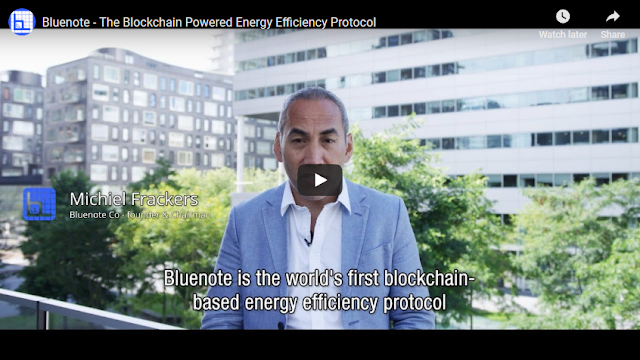 The software-based Bluenote Protocol can be used both with new applications and with energy technologies already installed in buildings throughout the world. Traditional data platforms centralize data in the hands of a single firm, controlling the market and locking-in participants. Bluenote’s platform enables product development but does not act as a data gatekeeper. Instead, data is managed by a decentralized network of nodes: the Bluenote Protocol. Openness, trust and a fair market for data are necessary to incentivize the beneficial sharing of confidential data such as energy usage, occupancy and financials. The protocol runs on a network of Nodes, packaged services connected through the network and maintaining a common ledger. Each node participates in a distributed file system, with a defined set of standard data formats and establishes a unified access architecture, called a slab hierarchy, for datastreamsfrom associated buildings. On top of the protocol and supported by the platform layer, a number of software modules operate, developed by both Bluenote and third parties. Buildings use Bluenote tokens, and associated smartcontract. A node provides a number of services packaged into an easily installable unit. Each node provides data acquisition and storage, processing capacity using a dataflow programming language, a building database including a geometric hierarchy locating data sources, a web front end to access the service, APIs for uploaders, downloaders and custom modules. Decentralization goes beyond the nodes into the building blocks themselves. Building geometrical description, data streams, data stream uploaders, processing instances, processing module classes and smart contracts are all accessed through a blink regardless of the actual node it is stored or executed on. 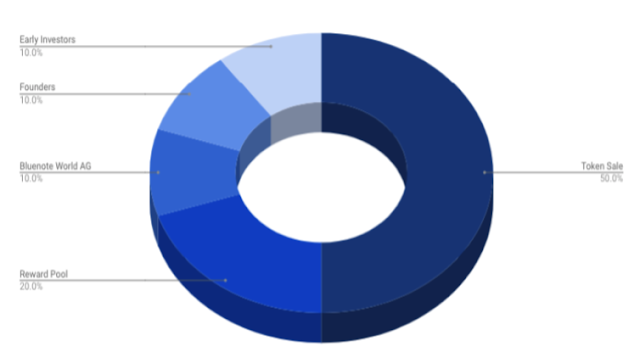 Bluenote is currently in the development stage, the development team a organize token sale, this is done to find funds for the development process of the Bluenote platform. Bluenote will issue an ERC20 standard token to power the Bluenote Protocol, ecosystem and economy, carried out via a Token Generation Event (TGE).